Most Russians claim they have felt no effect from Western sanctions and expect that the sanctions will be good for the national economy, sociologists have told Interfax. A relative majority (41 percent) of 1,630 respondents polled by Levada Center in 134 populated localities in 46 regions in September said the sanctions were aimed against the civilian population (the indicator stood at 31 percent in June 2014). Thirty percent of respondents said that the main target of the Western sanctions was a narrow circle of individuals responsible for Russian policy towards Ukraine. Twenty-one percent claimed that countries which had joined the sanctions gave no thought to the way the restrictions had affected ordinary people, and 8 percent could not identity the motive of the Western countries. A third of respondents (35 percent) claimed the sanctions had not created any problems for them or their families, and 44 percent said they had not faced any serious problems. Fourteen percent said the Western sanctions presented tangible problems and two percent reported very serious problems. However, 26 percent said the sanctions were potentially dangerous for their families. Russians were not unanimous in answering a question whether the Russian government was right to compensate the losses of sanctions-stricken companies from the budget. Forty percent supported the government's policy, 39 percent criticized it and 21 percent could not answer the question. In the opinion of 60 percent of respondents, the freezing of accounts and assets of Western companies which benefit from the sanctions would be a good retaliatory measure. Seventeen percent criticized that initiative, and 23 percent were undecided. 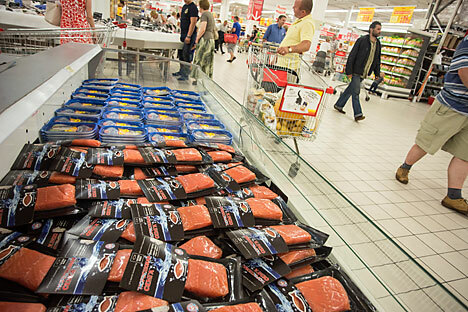 Russians were less understanding about the proposal to boycott Western goods. The idea gained support of 58 percent of respondents, 25 percent felt negative and 17 percent could not answer the question. On the whole, 59 percent of the respondents said that the Western sanctions and Russia's retaliatory measures would be good for the national economy. Twenty-five percent claimed the opposite, and 17 percent failed to answer the question. Some 68 percent of Russians said Moscow should not limit its support to the Donetsk and Luhansk people's republics by the demand of the West. Sixteen percent said the opposite and 17 percent were undecided. A majority (79 percent) was opposed to the return of Crimea to Ukraine, 14 percent supported the idea and 8 percent could not answer the question.